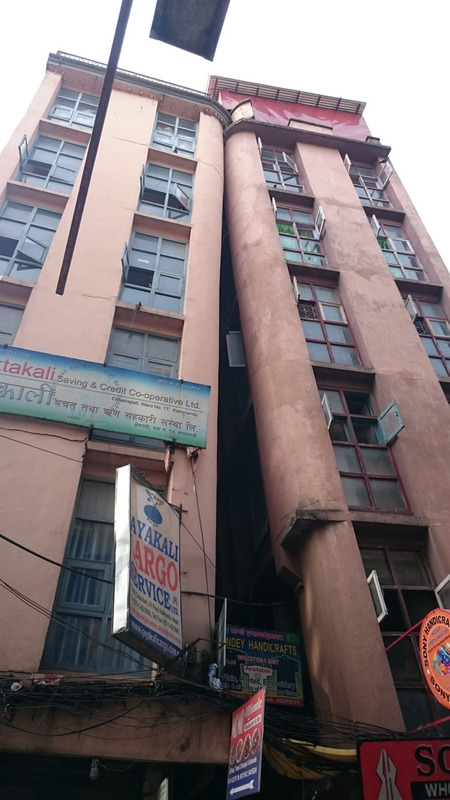 Just before noon local time on April 25, 2015 at 11:56 am, a moment magnitude (Mw) 7.8 earthquake struck central Nepal and was felt in the capital, Kathmandu. 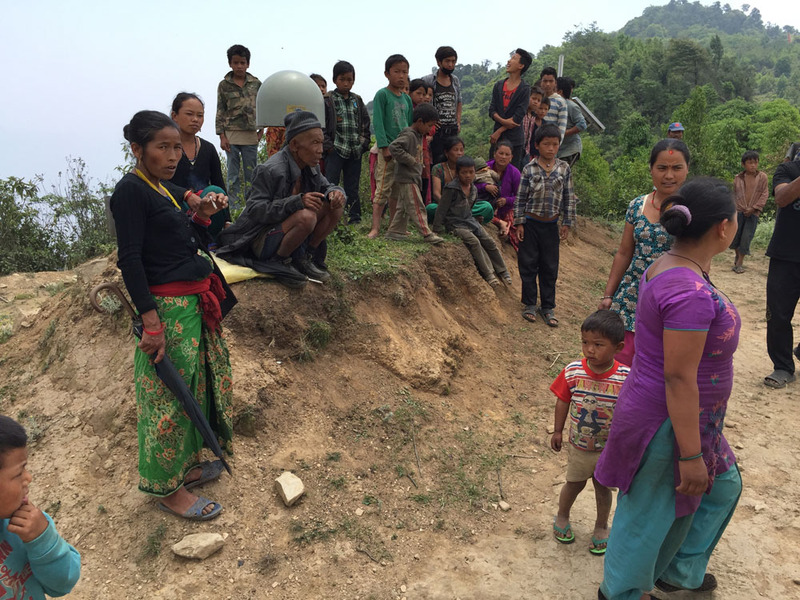 Please see the U.S. Geological Survey (USGS) summary and Nepal’s National Seismological Centre summary of the Gorkha earthquake for more information about the event and aftershocks. 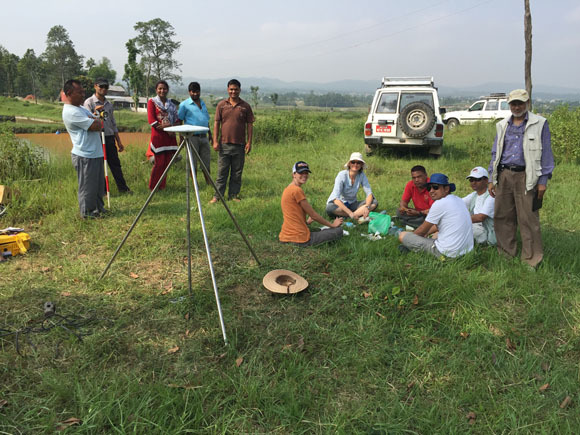 Hours after the event, UNAVCO rolled into action at the request of Professor Jean-Philippe Avouac at the California Institute of Technology (Caltech) to collect high sample rate (HSR) GPS data from the GPS network installed by Caltech and the Nepal Department of Mines and Geology a decade earlier. 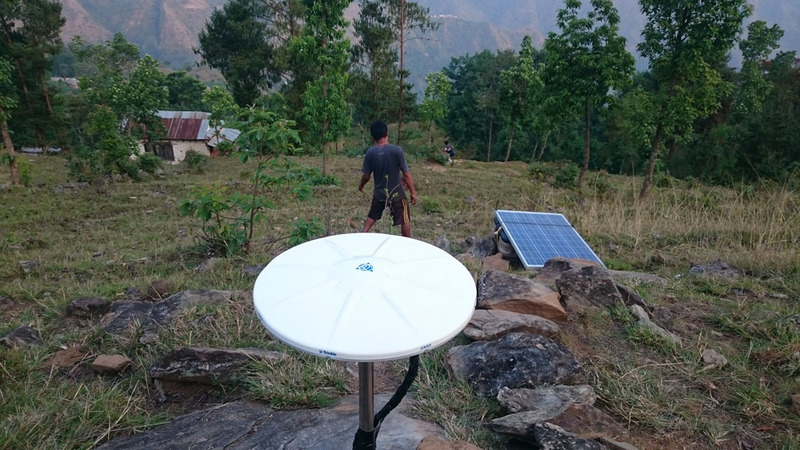 John Galetzka — UNAVCO’s project manager for TLALOCNet in Mexico — landed in Kathmandu on April 29 to lead the effort to collect data and get stations online. 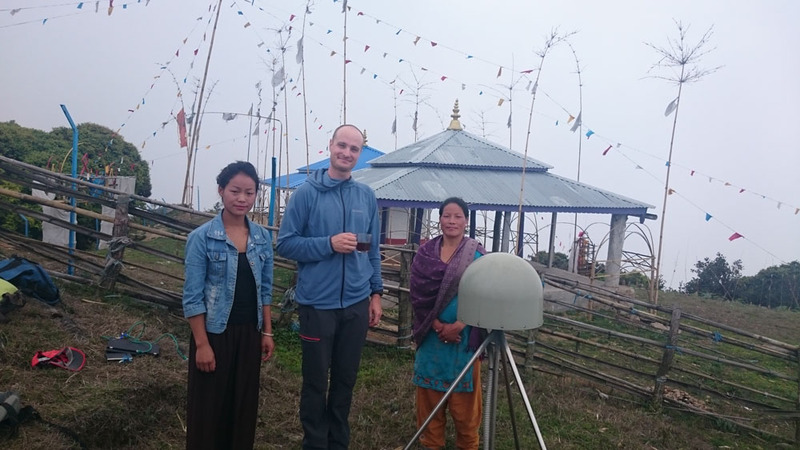 Before joining UNAVCO in March 2014, John worked for Caltech from 2002 to 2013, and installed 28 GPS stations in Nepal during that time frame. 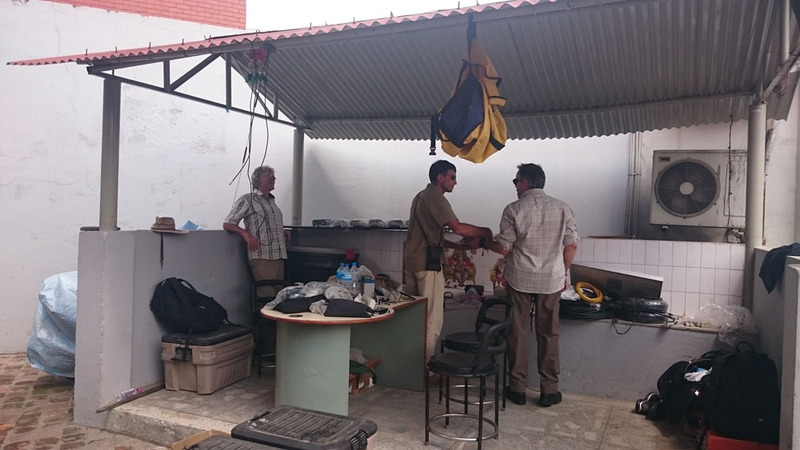 Professor Roger Bilham from the University of Colorado, Boulder teamed up with John several days later, and on May 10 UNAVCO field engineer Michael Fend arrived in Kathmandu with spare parts, additional tools, and relief supplies from donors in the Boulder area. Other colleagues from the USA, Nepal, France, the United Kingdom and Italy joined Mike, Roger and John to help recover GPS data, repair stations, add telemetry where possible, survey pre-existing survey markers, and install new GPS stations. All of the institutions involved in this project pledged to have their data archived at UNAVCO and allow the data to be openly accessible to the public. Please see the UNAVCO Community Event Response for more information and more data. The rapidly produced GPS and InSAR data products from the Mw 7.8 mainshock, and the occurrence of a Mw 7.3 aftershock on May 12 to the east of the mainshock altered the focus of the group. 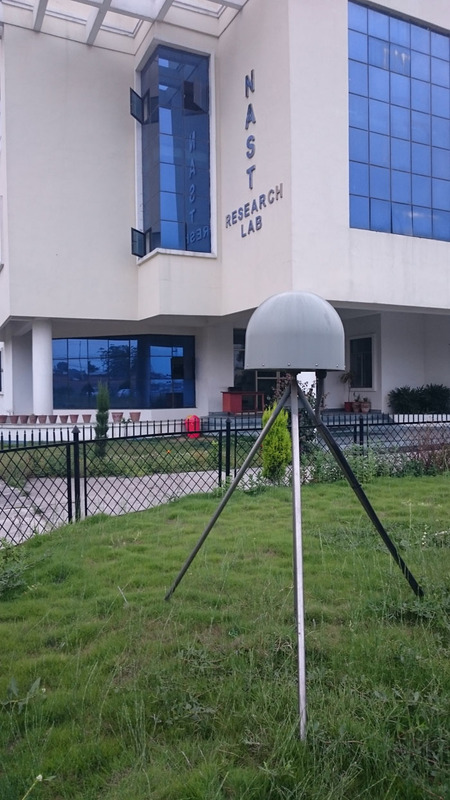 Five stations in difficult to reach western Nepal were ignored and priority was shifted to recovering HSR data and densifying the GPS network south of the mainshock and around the large aftershock. At the time of the April 25th earthquake, nine Caltech GPS stations were still telemetering data, but the fate of the 19 other stations was unknown. 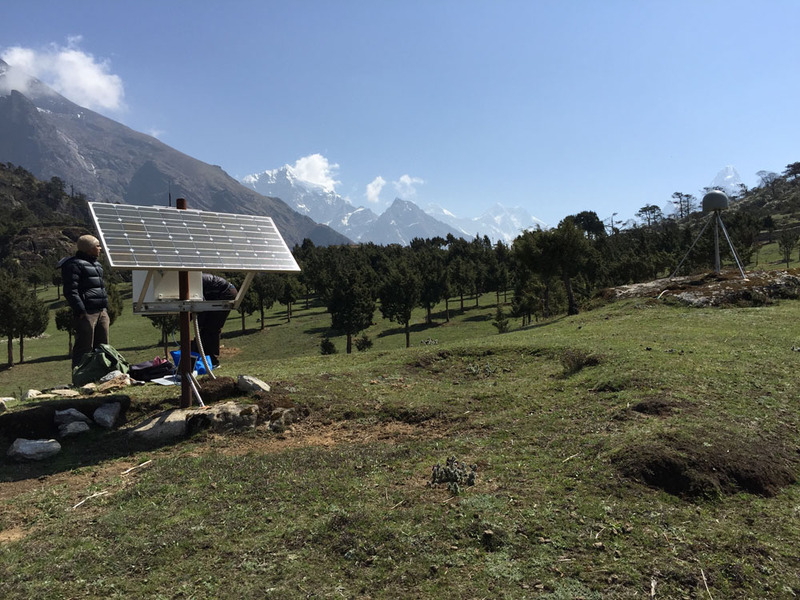 Two months later when UNAVCO staff departed Nepal and the monsoon rains arrived, 21 Caltech stations were up and running, two were found vandalized and have not been re-established, and five could not be visited and have no telemetry. 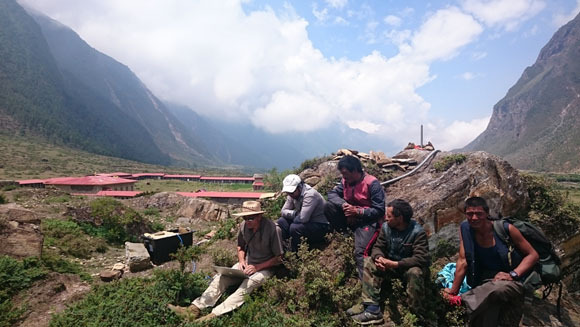 The high rate GPS data products from the mainshock were analyzed by David Mencin, UNAVCO Project Manager in Boulder with support from Professor Roger Bilham in Nepal. 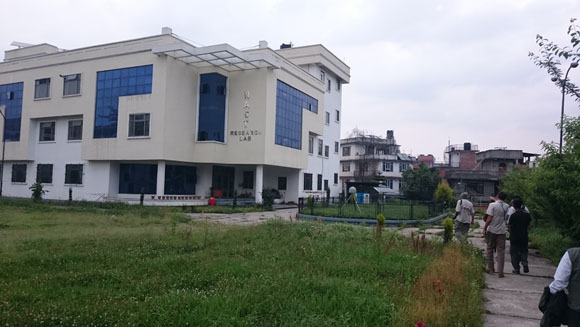 In particular, the motions of GPS station NAST in central Kathmandu at the Nepal Academy of Science and Technology, showed how the earthquake shook the city. 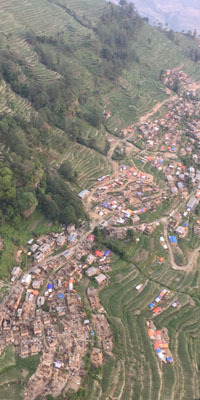 Kathmandu is located in a sedimentary basin, against higher ridges of denser igneous rocks. Once the seismic waves reached the basin, they continued to shake the city by bouncing (resonating) back and forth from one side of the basin to the other. The seismic resonance of the basin is somewhat analogous to a bathtub filled with water and then the water is disturbed creating a wave that sloshes back and forth in the tub. 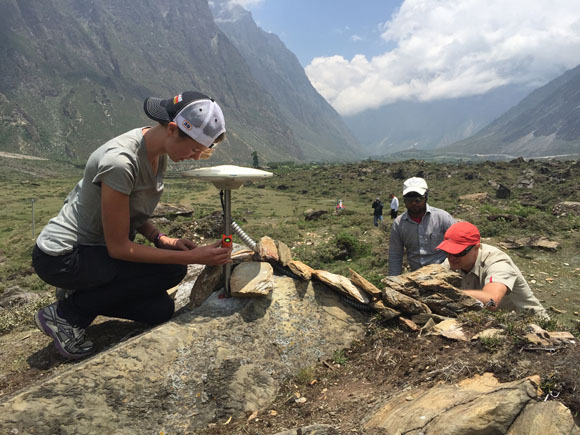 A video of the horizontal motion of GPS station NAST (within the basin) compared to GPS station KKN4 (on a ridge outside of the basin) illustrates the resonance of NAST within the city compared to little to no resonance at KKN4 outside the basin. The NAST station continues to move back and forth long after the KKN4 station stops moving. 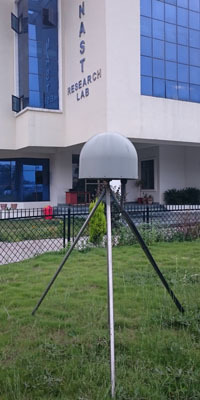 In another video, the horizontal motion of NAST is compared to a stationary camera video in a square in Kathmandu that shows how the people and other objects moved back and forth with the ground motion. 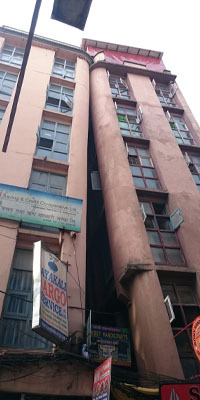 Another video recorded by Michael Fend on a street in Kathmandu shows a similar basin resonance associated with the May 12th aftershock. UNAVCO and our partners are grateful to Trimble Navigation Limited for donating seven NetR9 receivers and Morningstar solar controllers to Caltech, for providing funds for helicopter transport, and for sending engineer Michael O’Grady to Nepal to support the effort in many ways. UNAVCO would also like to thank Filters for Families, based in Colorado for providing relief supplies that were taken to Nepal by Michael Fend for distribution by relief agencies. The high rate data were recovered thanks to a rapid intervention funded by NASA (US) and the Department of Foreign International Development (UK), and engineering services provided by UNAVCO through the GAGE Facility with support from the National Science Foundation (NSF) and NASA under NSF Cooperative Agreement No. EAR-1261833. NSF support through rapid response awards (RAPID) to Rebecca Bendick, University of Montana and Roger Bilham, University of Colorado, Boulder are also gratefully acknowledged (No. EAR-1546633). Manual download of co-seismic high-sample rate (5Hz) data from 10 continuous GPS stations, four of which were directly over the rupture (KKN4, NAST, SNDL, RMTE, CHLM, SYBC, TPLJ, BRN2, DNSG, and GRHI). Repair and manual download of pre-seismic standard sample rate (15-second) data from 19 continuous GPS stations which were not functioning, or had broken/no telemetry at the time of the mainshock (KLDN, BRN2, ODRE, RMJT, SYBC, LMJG, CTWN, GRHI, SIM4, KKN4, BELT, KAWA, NAST, KIRT, DMAU, GHER, BESI, GUMB, and DAMN). Short (1-4 days) occupation of four pre-existing campaign GPS sites (BIRA, ILM0, JHP1, and TRS4). Continuous occupation of four pre-existing campaign GPS sites for 6 to18 months (AIRP, BNDP, JANK, and DNC4). Training of individuals from UMT, NAST, TU, and CU on how to install Caltech-style campaign GPS monuments. Help partners to establish and continuously occupy eight new campaign GPS sites for 6 to18 months (OKR1, JIR2, SLBL, MKLU, XBAR, TSM1, BTNI, and XYAK). Training of individuals from NAST, TU, and UMT on how to install shallow driven-braced monuments. 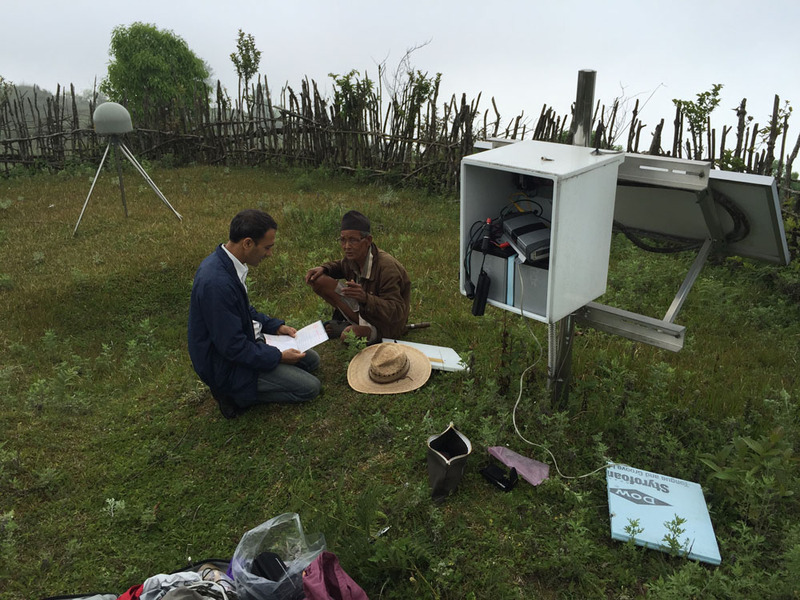 Help partners to install three new continuous GPS stations using shallow driven-braced monuments and GPS hardware provided by ICTP (HETA, BGNJ, and BRWA). 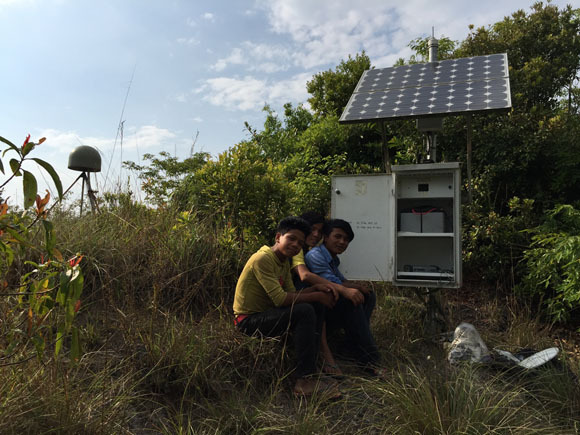 Enable GNSS tracking at five stations (KKN4, BNDP, TSM1, ODRE, and DNC4). Provide the Cambridge seismic team access to dozens of GPS sites for deployment of broadband seismometers. Repair and manual download of the pre-existing USGS Netquake accelerometer (site code: KATNP) located at the American Club (aka Phora Durbar) in the heart of Kathmandu, and troubleshooting of the new USGS Netquake accelerometer at the National Society for Earthquake Technology (NSET). 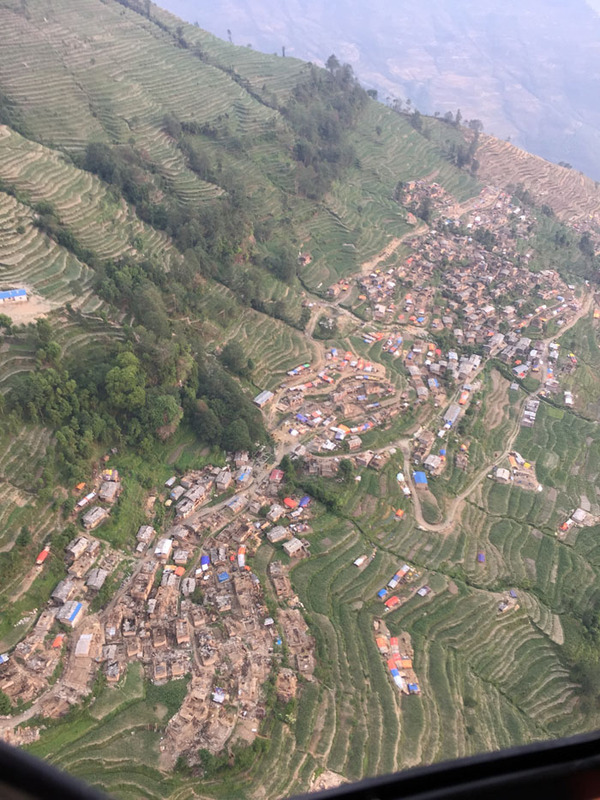 Pave the way for USGS landslide experts to contract with a safe and reliable charter helicopter service. 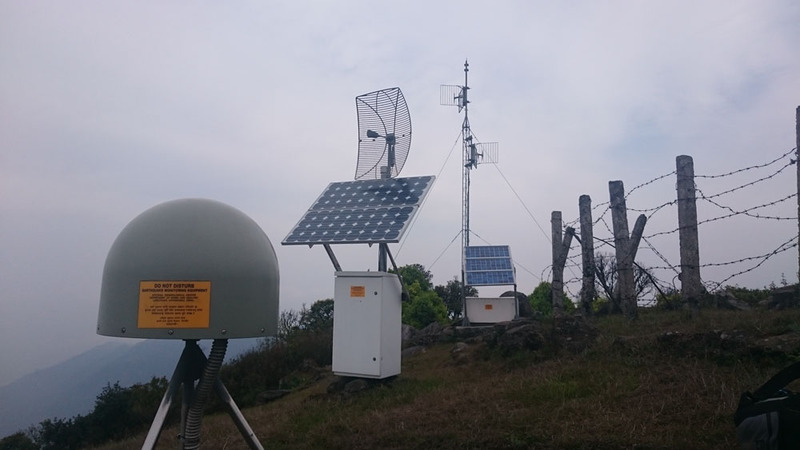 Facilitate troubleshooting and repair of three remote DASE/NSC seismic stations co-located with Caltech GPS stations. Boost number of telemetered GPS stations in Nepal from nine before the mainshock, to over 30 as of June 27, 2015; although intermittent, five stations are on UNAVCO VPN (KKN4, BNDP, SNDL, RMJT, and SIM4) via cellular carrier. 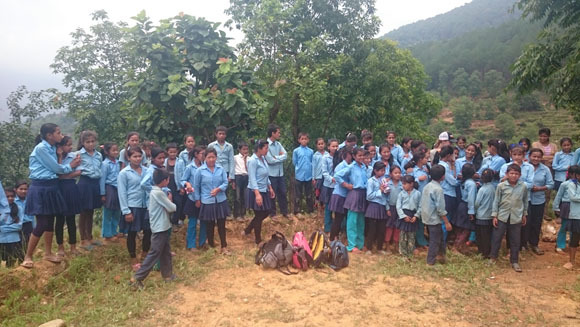 Provide and support humanitarian relief, where feasible and appropriate. 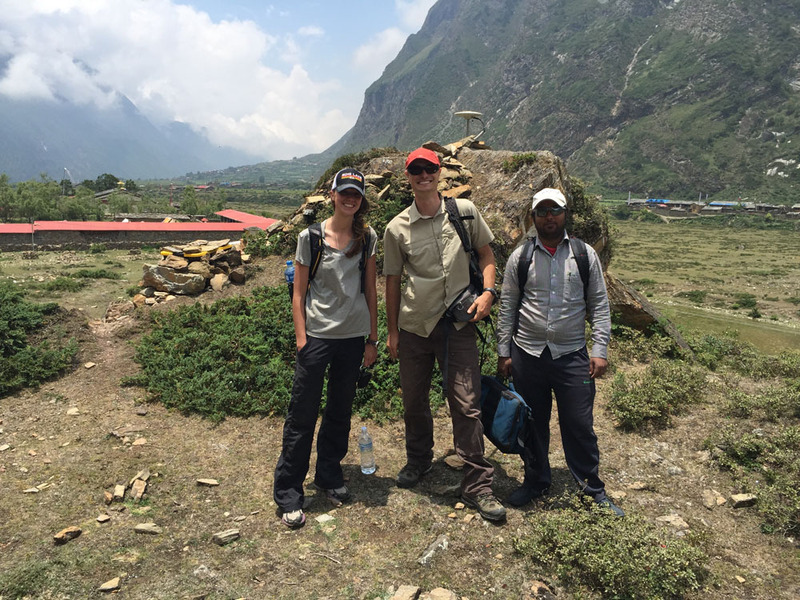 On May 3, 2016, UNAVCO Field Engineer John Galetzka received the John Wesley Powell Award from USGS Director Suzette Kimball in recognition of his efforts toward earthquake preparedness in Nepal, his disaster relief efforts following the magnitude 7.8 Gorkha earthquake and for providing key data to understand the source, shaking and damage from the event. Science paper: Slip pulse and resonance of Kathmandu basin during the 2015 Mw 7.8 Gorkha earthquake, Nepal imaged with geodesy, Galetzka et al.